The weather was absolutely perfect on our first full day in San Francisco. In fact, I felt a bit over-dressed in my jeans and long-sleeved blouse. We took full advantage by walking around, eating outside and doing a bit of shopping. To top it off, I randomly ran into my friend Krystal of This Time Tomorrow. What a pleasant surprise! Then I got an email from a reader who spotted me on the street this same day. Small world! On an unrelated note, I'm going to start linking to items I'm wearing whenever possible. The main reason being that I so often wear stuff that isn't current. I hate to send you down a fruitless path! pretty pink blouse. love the ruffles. hope you enjoyed sf! I am in love with this outfit!! THe frilly top is adorable. AWESOME hat. And thanks for linking! 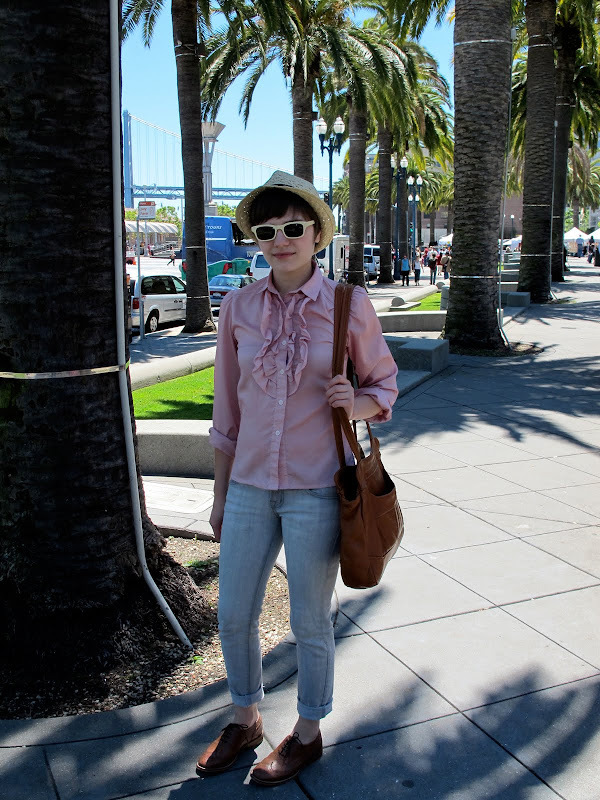 I was in San Francisco last March and I enjoyed it so much! Great look, comfortable but pretty! cutte! love shoes and bag. You look so adorable, love the way you are wearing your jeans. that's an adorable outfit :) I love your top! I love this look. It's one of my faves of yours!!!! Why I haven't got myself a pair of brogues by now I'll never know, it's like I'm waiting for the perfect pair (like yours) to jump into my lap!! !